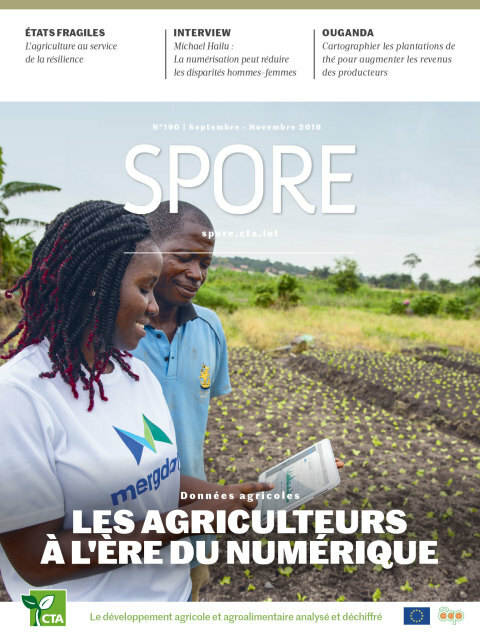 Business transactions in agriculture have been transformed by the digitisation of the value chain. The first big impact came with barcodes, which made it possible to track items through a value chain. Then came handheld mobile data collection devices, more affordable sensors to track conditions, followed by the internet to transform links with consumers. Mobile phones now take over many of these roles. Barcodes have been replaced with RFID and QR codes. Despite this progress, there are still many challenges relating to the traceability of products and transparency in supply chain management. Database systems managing transaction records were managed in isolation, not open to all the other stakeholders in the chain; they were open to fraud, and transactions were difficult to secure. 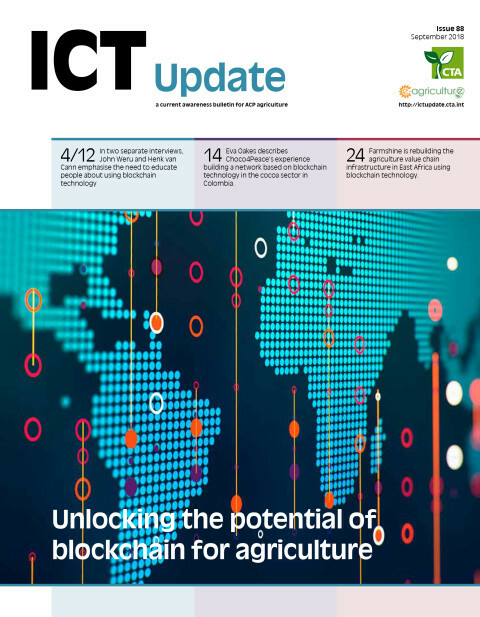 One technology apparently has the potential to provide answers to a number of issues in agriculture, from farmer IDs to smart contracts, from traceability and improving certification, digital payments, insurance, consumer feedback and improved logistics. It is the blockchain. The articles in this issue begin by providing a history and defining the blockchain. We learn why more people need to be educated on the blockchain before choosing how to use it. Common themes recur in these cases. The blockchain is often a background addition to existing processes in the value chain and lends itself to recording transactions, thus ensuring issues of provenance and allowing certification. Applications use a mixture of public and private blockchains depending on the context, but a number seem to choose private blockchains so they can be integrated into existing systems and provide fast transaction recording and privacy in transactions, especially when the technology is deployed to support a specific supply chain network. Nearly everyone in this issue agrees that some knowledge is needed before moving to select a solution. IBM suggests asking five questions: Is the protocol open source and openly governed? Who will be part of the network? What use case will drive the transactions on the network? And is the technology modular and easy to use? These questions mean assessing whether the system will need to be a public or private blockchain, and which function the system should be optimised for. If the main issue is traceability, this will clearly lead to a different approach than for value transfer (involving cryptocurrency or tokens). We hear about projects being implemented around the world, such as the case of traceability in the Caribbean using BreadTrail and the use of blockchain in the cocoa sector in Columbia. We also hear about applications in Africa, particularly covering electronic payments, including an attempt to rebuild the agricultural value chain in East Africa. 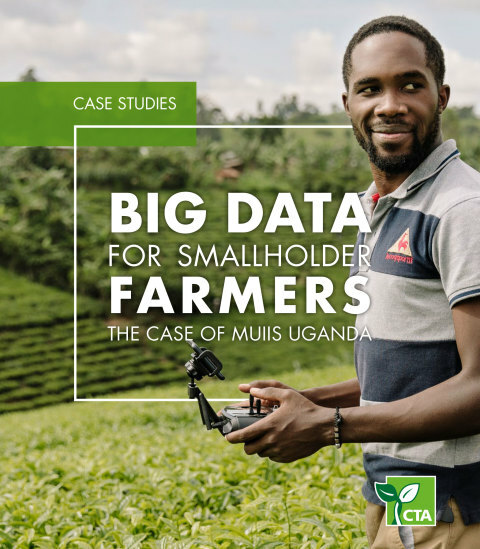 We learn how blockchain benefits and challenges smallholder farmers in Africa and how it has the potential to reduce value chain losses. The company Goldman Sachs estimates that blockchain could facilitate global savings of up to US$6 billion per year in business transactions. Apart from the benefits that the technology can generate, its limits and fallacies are also discussed in this issue. 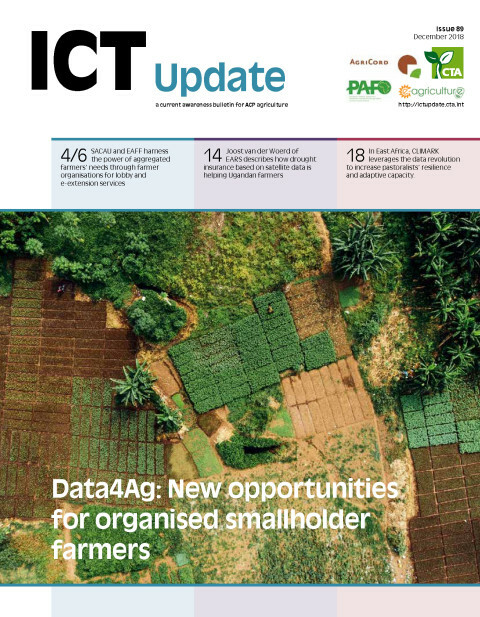 Aware of the opportunity of blockchain for agriculture in ACP countries and of the weak understanding of this technology in ACP countries, in October 2017 the Technical Centre for Agricultural and Rural Cooperation (CTA) organised a workshop to discuss that issue: ‘Perspectives for ICT and agribusiness in ACP countries: Start-up financing, 3D printing and blockchain’. It was organised in the framework of the forward-looking activities that CTA organises periodically on digital technologies, and one of its main focuses was the blockchain. 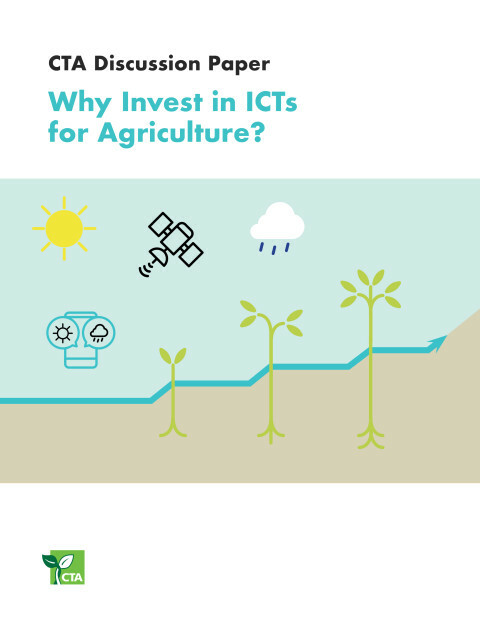 Why Invest in ICTs for Agriculture?